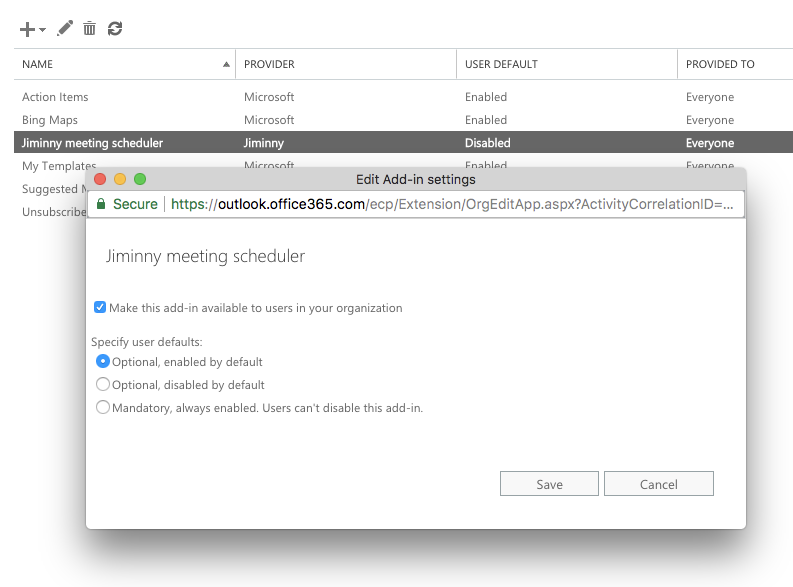 For simplicity, an Exchange Administrator can enable the Jiminny meeting scheduler add-in for all users or a select group. It is not yet possible to install via Centralized Deployment. Now all the users in the organization have the add-in installed. Once they restart Outlook or reload Outlook Web Access, they will see the Jiminny add-in. Installing the add-in for a subset of your users is more complex. You'll need to setup a Distribution List for them in Exchange, then connect to Exchange Online PowerShell. Refer to Manage User Access To Add-Ins For Outlook (section Limit Availability To Specific Users) and the Set-App Mailbox Cmdlet for instructions. Note: There are typos in the Manage User Access To Add-Ins For Outlook document provided by Microsoft. Every instance of "Organizationadd-in" should actually be "OrganizationApp". See the Set-App Mailbox Cmdlet document for correct examples! An individual user can install the add-in for themselves. It will only affect their account, not other users in the organization. For instructions please refer to the separate guide. Note: the add-in will soon be available in the Microsoft Store for easier installation!